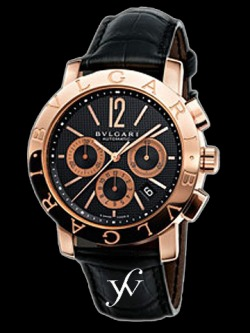 Chrono automatic watch with a BVLGARI logo 18kt pink gold case. It features a black dial and an alligator strap with a three blades 18kt pink gold folding buckle. Functions: Chronograph with hours, minutes, seconds and date.